About a month or two ago I was asked if I would review a new CD-Rom game called Snapshot Adventures -Secret Of Bird Island. It has taken me this long to finally give the game a try. It turns out that it is a CD- ROM game which sort of surprised me because I thought it was going to be a traditional board game. I haven't played a video game for a long time. I was really into an arcade game called asteroids that came out in the late 70's. The object of the game was simple. You had to blow up rocks and spaceships. I found it to be both entertaining and therapeutic. The Secret Of Bird Island is a little more difficult to explain than Asteroids but I'll try to keep it simple. The main focus of the game centers around the player taking photographs of birds using the mouse and clicker. There are 20 different geographical locations where you can search for 130 different species of birds. At the arrival of each location, you are given a photography assignment to complete by one of the games cartoon characters.. For example-The assignment might be- "Larry-give me 5 four star photos of birds in flight"
The most interesting part comes after each assignment is completed. You get to choose the best of your photos in side by side comparisons. You are also provided with many tools throughout the game to help improve the quality of your photos-longer lenses, night vision, external flash, bird callers, a magic-mirror thing that makes a bird want to preen, etc.. etc...-all kinds of stuff. I never got to the end but I imagine the surprises keep coming. Oh yes-I almost forgot. Part of the game is that your grandfather, who is a naturalist, has been missing for six months. You are given clues during the game as to the secret behind the mystery of his disappearance. There are also lots of other features in the game. You get to list birds, keep a field journal with photos, and invent your own species of bird, to name a few. Even though I don't have much interest in video games, I found this one to be fairly entertaining. The graphics may not be on par with the video games that are put out by the gaming giants these days but the bigger game companies probably don't offer a game that has to do with birding. I think that it would have een beter if the characters in the game were a bit less silly and cartoonish looking. Also, some of the tools provided to the player are outdated. For example, the bird caller they provide is one of those old-fashioned twisty bird-callers instead of a Birdjam. Overall though, I would say this is a very creative game that might be worth a look for those who are interested. A double tailed comet named Lulin will be visible through binoculars this week if you know when and where to look. If you look east-southeast in the sky at 9pm the comet should be very close to Saturn. 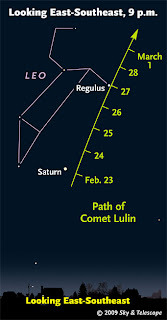 It will follow a path between Saturn and the bright star, Regulus in the constellation Leo from February 23-27. Here is a link to Sky And Telescope .com that can give you more details. I plan to search for it tonight. From what I heard on NPR, the comet was discovered by a 19 year old student in China. The comet is unusual in that it has a tail at both ends. It is also traveling around the sun in a direction opposite that of the planets in our solar system. I spent my morning on Saturday searching for birds in the Durham area. As I was driving along, I noticed a large flock of ducks swimming in a swampy portion of the Coginchaug River. Most of them were Mallards, but I could see a small group of Wood Ducks, including two brilliantly colored males. I was excited at the chance to finally get a decent photo of a Wood Duck but I would have to sneak up on them through some brush in order to accomplish that. I wasn't two steps into the woods before every duck in the area had taken to the air and disappeared. This sort of thing happens to me all too often. It was that moment I remembered an article by Mike Atkinson. In part of his article he used the term "soft targets" -birds that are easy to photograph. I decided that for the remainder of that morning, I would only take photos of birds that were willing to pose for my camera. My first subject was the Northern Mockingbird in the top photo. Mockingbirds are notorious for protecting their winter food supplies. Once they've found a bush full of berries, they will stick to it like glue. When I moved closer to the mockingbird for a better photo did it fly away? No, instead it gorged its mouth full of sumac and then hid in the center of the bush. It seems that the mockingbird was worried about me getting at his food source! My next stop was at Lyman's Orchard in Middlefield. They have a man-made pond that is always loaded full of waterfowl but it was the pigeons that first caught my attention. I enjoyed watching some of the courtship behavior of the male pigeon. This male pigeon is performing a courtship display called bowing in which he puffs up his neck feathers, drops his head down, and turns around in circles. I think it is also doing some tail-dragging . This is when he fans out his tail and drags it on the ground while following close behind a female. I was surprised to learn that Rock Doves mate for life. Most of the waterfowl at Lyman's Orchard is comprised of Mallards and Canada Geese. There are large numbers of these birds and occasionally reports of interesting species such as Cackling Geese. There are also a number of domestic species that can be seen here including Graylag Geese, funky-colored domestic mallards, and Muscovy Ducks. The facial pattern on the male Muscovy-(seen above)-is strangely unique. It looks like a chicken-duck to me. One thing I noticed about the pond at Lyman's is that there doesn't seem to be much of a mess considering all the ducks and geese that hang out there.They fence the pond in which helps but I'm thinking that someone must regularly clean the grounds. I'll have to ask next time I go there. They also have a nice country store called the Apple Barrel which has fresh fruit, baked goods and a great deli. There is a nice picnic area that overlooks the pond. Here is a video of two male mallards fighting it out. One was clearly dominant over the other. This video actually contained another minute of footage but I had to trim it down in order for it to upload onto the blog. I can assure you that as brutal as this footage seems, the beaten duck flew away without any apparent physical injury. I have to wonder if anything is going through his mind after such a humiliating defeat though. A drove a few miles down the road to Mckenzie Reservoir in Wallingford. Earlier in the Fall a Barnacle Goose was seen there by many birders. The reservoir, which is intersected by a road, had a small area of open water at one end. There was a nice mix of species condensed into a very small area which included Canada Geese, Greylags, Mute Swans, Mallards, American Wigeons, Common Mergansers, Hooded Mergansers, and Gadwall. The Hooded Mergansers semed to be braver in the company of Canada Geese. This is the first close look I've had of a male Gadwall (left). I saw a distant flock of them along the western shore in January but it wasn't until Saturday that I was able to see some of the subtle detail of their plumage. I may have started out taking photos of "soft targets" but I was able to see a variety of species and observe some interesting bird behavior in the process. After all that intense birding I was left with about as much energy as Superman after eating a box full of chocolate covered Kryptonite. The month of January was all about seeing as many species of birds that I could find. From now until the end of April I will focus on quality not quantity. I will be selective about where I go and spend more time observing birds in one place rather than jumping from one place to another. One of the ways that I search for new birding places is to do a google search of an individual town. I will enter keywords like hiking trails or nature preserves along with the name of the town. It was in this way that I came across the Middletown Trail Guide. Most of the trails listed in this guide were familiar to me but I had never heard of Ravine Park. It was listed as only 8.8 acres with a trail only 1/10 of a mile long. This sounded like an easy way for me to start the month of February. If I can't walk a tenth of a mile then I might as well not leave the house. When I came upon the location of the park, I realized that it was nothing more than an insignificant little mud hole of a pond that I had passed by so many times over the years. I almost turned around and left the minute I saw it. Almost, but not quite. Upon checking the trail, I was slightly encouraged to find that it led through a steep ravine. It wasn't long before I started to hearing and seeing lots of birds. There were Northern Cardinals singing semi-automatic drip-drip-drip-drip-drip notes. Dark-eyed Juncos were feeding underneath the tangles, while others bathed and drank water from the shallow stream. Hairy and Red-bellied Woodpeckers hammered away at trees while a Northern Flicker perched high on a branch and cried out a series of squeals. If this place was insignificant, someone forgot to tell the birds. Just a few minutes before I looked at this so-called park as nothing more than a patch of urban trash . Now I was seeing and hearing dozens of birds making full use of the food, shelter, and water that was provided here. This stream is so shallow that I could probably walk through it barefoot and not get my feet wet but it was the perfect depth for songbirds. In the short time I was there I saw Juncos, American Robins, sparrows, and American Goldfinches drinking and bathing in this pipsqueak of a brook. Check out this video of a bathing goldfinch and notice all the bird chatter in the background. On Sunday, I visited one of the Taylor/Palmer preserve-(entrance is across from St. Clements on route 66 in Portland)-, which was acquired by the Middlesex Land Trust in recent years. Lately, I've been noticing more and more parcels of land that have been marked as preserved by the Middlesex Land Trust. The members of that land trust should be commended for the great job they are doing! The preserved areas of land vary from quite large to just a couple of acres in size but you know what they say-"An acre saved is an acre earned". I'm glad that more and more landowners are considering donating land for preservation as an option. I followed the well laid out trails marked in red through the Taylor/Palmer preserve. The skies were blue when I started so I was surprised when it started to rain. I took shelter in this old railroad culvert until the showers passed. It sort of looks like an entrance to the church of nature, doesn't it? The highlight of this was was observing a dozen or so Eastern Bluebirds foraging through some leaves on the ground that had recently thawed. As I was jotting this down in my journal, one landed just inches from my foot. It's amazing what you can see when you slow down long enough to look. New Environmental Study: Over Half of New York State’s Birds Have Seen Dramatic Population Changes Since 1980- Ithaca, NY (1/07/2009) -- A new atlas on the birds of New York reveals that during the past two decades over half of New York State’s bird populations have seen dramatic changes in their distributions, with 70 species experiencing significant increases, 58 species experiencing serious declines, and 125 species maintaining relative stability. Among the birds showing the largest increases in New York State are Canada Goose, Wild Turkey, Red-bellied Woodpecker, Carolina Wren, Peregrine Falcon, Osprey, Cooper’s Hawk, Bald Eagle, Common Raven, Turkey Vulture, and Merlin. Those showing the largest decreases are Henslow’s Sparrow, Red-headed Woodpecker, Brown Thrasher, Common Nighthawk, Purple Martin, and Canada Warbler. Resident woodland birds showed the greatest increases as a group, and grassland birds showed the greatest declines. These new findings, published this month by Cornell University Press in The Second Atlas of Breeding Birds in New York State, are the result of over 140,000 hours in the field by nearly 1,200 volunteers across New York State. The atlas, edited by two prominent figures in the field, ornithologist Kevin J. McGowan of the Cornell Lab of Ornithology, and wildlife biologist Kimberley Corwin of the New York State Department of Environmental Conservation (NYSDEC), was initiated by the New York State Ornithological Association and implemented by the NYSDEC, which provided the funding, management personnel, oversight, direction, and data capture and management. The majority of the funding came from the state tax check-off program, “Return a Gift to Wildlife.” “This new atlas was truly an incredible team effort by the citizens of New York,” said Kevin J. McGowan. “From those who funded it with small donations via their tax returns to the impressive volunteers who collected the data, the atlas is an inspired monument to the dedication and love New Yorkers have for their wildlife.” Added Kimberley Corwin, “And what’s more, New Yorkers have considerably helped bird populations by planting trees and shrubs that provide food and cover, supporting conservation organizations, and participating in cutting-edge programs such as the Landowner Incentive Program, which we think is outstanding.” The Second Atlas of Breeding Birds in New York State will be an invaluable resource for the DEC and other state agencies involved in land management and conservation, as well as counties and towns who make management decisions on smaller scales. Data will also be used at the national level by federal agencies, non-governmental agencies such as the NY Natural Heritage Program and Audubon, as well as universities across the country. Ithaca, NY--People of all ages are invited to go outside and look for Birds in Art/Art in Birds for a contest sponsored by the Celebrate Urban Birds project at the Cornell Lab of Ornithology. Celebrate Urban Birds is a free, year-round citizen-science project focused on birds in neighborhood settings. For the Birds in Art/Art in Birds challenge you can take photos, do some painting, write a story, create a sculpture. What do you see in a bird that is beautiful, stirring, or inspirational? It could be a broken-down nest in winter, a song recording, video of a bird perching on your window, something that makes you stop, look twice, laugh, cry. Prizes include bird sound recordings, books, gift certificates, "green" products, and more. We’ll send the first 50 entrants a copy of our "Doves and Pigeons" poster by Julie Zickefoose. Selected images will be posted on the Celebrate Urban Birds website. 1. Email your photo, art, or video entry to urbanbirds@cornell.edu. Links are acceptable for videos.2. Write "Art in Birds/Birds in Art contest" in the subject line. 3. Include your name and mailing address 4. Tell us why you submitted your entry to the Art in Birds/Birds in Art contest. Visit the Celebrate Urban Birds web site for more information. The Cornell Lab of Ornithology is a membership institution dedicated to interpreting and conserving the earth’s biological diversity through research, education, and citizen science focused on birds. Visit the Lab’s web site at http://www.birds.cornell.edu/. JOIN THE GREAT BACKYARD BIRD COUNT -Count for Fun, Count for the Future February 13-16, 2009New York, NY and Ithaca, NY­-Bird and nature fans throughout North America are invited to join tens of thousands of bird watchers for the 12th annual Great Backyard Bird Count (GBBC), February 13-16, 2009. A joint project of the Cornell Lab of Ornithology and the National Audubon Society, this free event is an opportunity for families, students, and people of all ages to discover the wonders of nature in backyards, schoolyards, and local parks, and, at the same time, make an important contribution to conservation. “Anyone who can identify even a few species can contribute to the body of knowledge that is used to inform conservation efforts to protect birds and biodiversity,” said Audubon Education Vice-President, Judy Braus. Volunteers take part by counting birds for at least 15 minutes on one or more days of the event and reporting their sightings online at http://www.birdcount.org/. The data help researchers understand bird population trends across the continent, information that is critical for effective conservation. In 2008, participants submitted more than 85,000 checklists, a new record. “The GBBC has become a vital link in the arsenal of continent wide bird-monitoring projects,” said Cornell Lab of Ornithology director John Fitzpatrick. “With more than a decade of data now in hand, the GBBC has documented striking changes in late-winter bird distributions.”Participants submit thousands of digital images for the GBBC photo contest each year. Last year’s winners have been chosen and are now posted on the web site. Participants are also invited to upload their bird videos to YouTube tagged “GBBC.” Some of them will also be featured on the GBBC web site. All participants will be entered in a drawing to win dozens of birding items, including stuffed birds, clocks, books, feeders, and more.Businesses, schools, nature clubs, Scout troops, and other community organizations interested in the GBBC can contact the Cornell Lab of Ornithology at (800) 843-2473 (outside the U.S., call (607) 254-2473), or Audubon at citizenscience@audubon.org or (215) 355-9588, Ext 16. The Great Backyard Bird Count is made possible, in part, by support from Wild Birds Unlimited. Ithaca, NY--The Cornell Lab of Ornithology invites organizations and educators to apply for its Celebrate Urban Birds project mini-grants. Mini-grants average $100 to $500 and help fund neighborhood events across North America. Organizations working with traditionally underserved communities are strongly urged to apply. Celebrate Urban Birds is a free year-round project that collects information from everyday people about 16 species of birds that may be found in urban areas. Participants spend 10 minutes watching birds in their neighborhood and report their observations online at http://www.birds.cornell.edu/NetCommunity/page.redir?target=http://www.celebrateurbanbirds.org&srcid=2666&srctid=1&erid=243640. This information helps scientists better understand how birds survive in cities and make use of greens spaces, including parks and gardens. To apply for a mini-grant, please visit http://www.birds.cornell.edu/NetCommunity/page.redir?target=http://www.CelebrateUrbanBirds.org&srcid=2666&srctid=1&erid=243640. No experience with birds required. Saturday was my last chance to add to my January list. I met up with a group of birders at the commuter parking lot in Chester for what we called missed species trip. Our plan was to make several stops along the shoreline between Old Lyme and Stratford until we ran out of daylight. The morning started out on a good note when I was able to add Purple Finch to my list at our very first stop. Hammonasset proved to be a worthwhile visit. There were loads of people there to watch a charity event which features swimmers taking a plunge into the ice-cold water. Too bad I was busy birding, or I might have joined them. It was during an extended visit to the rest area at Meig's Point Nature Center that we saw an American Bittern fly across the parking lot into a nearby gully. That was a bird that many of us needed for our list, including me. We made a stop at Meig's point where we were able to find a few Purple Sandpipers at the end of the jetty. It was during a lunch break in the West beach parking lot that I spotted these White-winged Crossbills having a lunch of their own. Even though I didn't need this bird for my list, it was nice to finally get a close up view of them. The top photo of the female shows a little bit of her crossed bill. The bottom photo of the male shows the overall red coloring . The wings are darker with white markings on them. Somehow, I felt that the sighting of these birds was a sign of good things to come. When I saw them last week, they were gone as soon as they sniffed the pine cones , but on Saturday they just couldn't seem to get enough of them. I'm looking forward to spotting some more at some other unexpected location during the winter. One way of finding them is to look for bits of cone debris falling from coniferous trees in an area where you suspect they may be. In the video, you can hear some other birders conversing. You can hear our trip leader joke that the lone male crossbill had a harem after a second female showed up. I forgot exactly where this spot was, but check out the mega- lens on that camera. The photographer also used the lens to spot his birds. I'm hoping he may send me a photo of a Red-shouldered Hawk he took during our trip. It was taken from about 100 yards away. I'm curious to see how it came out. After lunch, we worked our way towards New Haven. On the way down, I saw a flock of Wild Turkeys grazing on the side of the highway. I tried to get every one's attention but it was difficult to do when we were traveling 75 miles-I mean-65 miles an hour along I-95. That was one of the target species that I was able to add to my list. I was disappointed to have missed Common Grackle and Yellow-bellied Sapsucker for the month of January. I guess I just wasn't in the right place at the right time. It was at a stop in a restaurant parking lot in New Haven where we saw all of these scaup in the photo . We also had a surprise sighting of 4 Greater Yellowlegs just down the road from there. In a way, I guess you could say that we saw 8 yellow legs since there were 4 birds and each had 2 legs. We missed out on finding a Black-headed Gull or a night heron, both of which we were hoping for. I must say that it has been a long and challenging month of birding for me. If it weren't for the fact that I like birding so much, you could say that these all-day birding marathons were like a hard day of work. From dawn to dusk you have to drive, set-up and move on constantly. The weather was very cold and our breaks were very short. As I said though-if I didn't like birding so much. One of the guys in the group called it microwave birding (done in 2 minutes). That was kind of the joke for the day. I could tell that he was anxious to make use of his new scope but there were some stops that he didn't even have a chance to look through the eyepiece before we were off and running again. I'm not going to get into the specifics of all the birds we saw total number of species for the day was 66. It was at dusk that I recorded my final species for the month of January. A flock of Boat-tailed Grackles landed in a tower at the airport in Stratford, just as the sun was setting. This was a lifebird for me. The photo is a view of the marsh just across the road from the towers where the grackles landed to roost for the night. What a magical way to end the month of January. Thanks to all of you who joined me in participating in the birding tradition known as "Big January." I hope you all enjoyed it as much as I did.